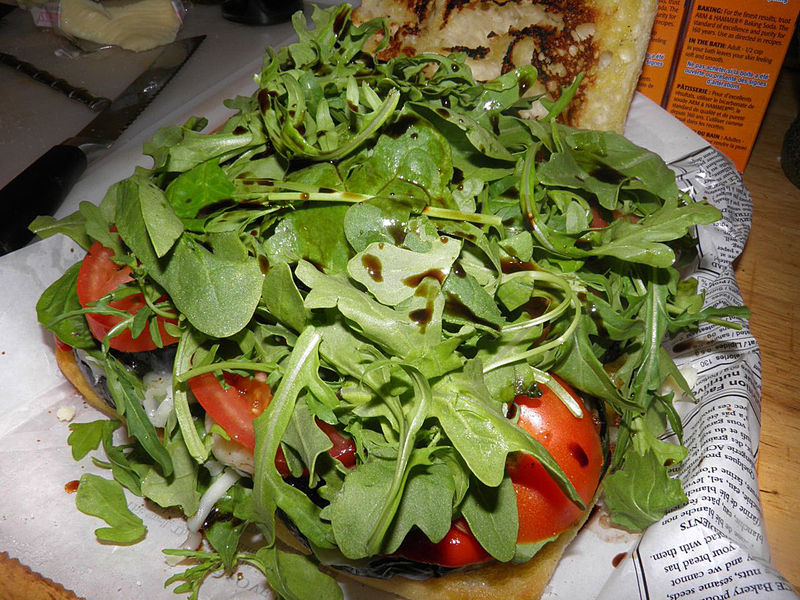 There's a lot going on in the sandwich. Can sandwich filling be “filling” if it doesn’t contain meat? That’s a common complaint about many vegetarian dishes. People often say that they feel hungry far sooner than when they have meat as part of their meal. Well that doesn’t have to be the case. This sandwich proves my point. 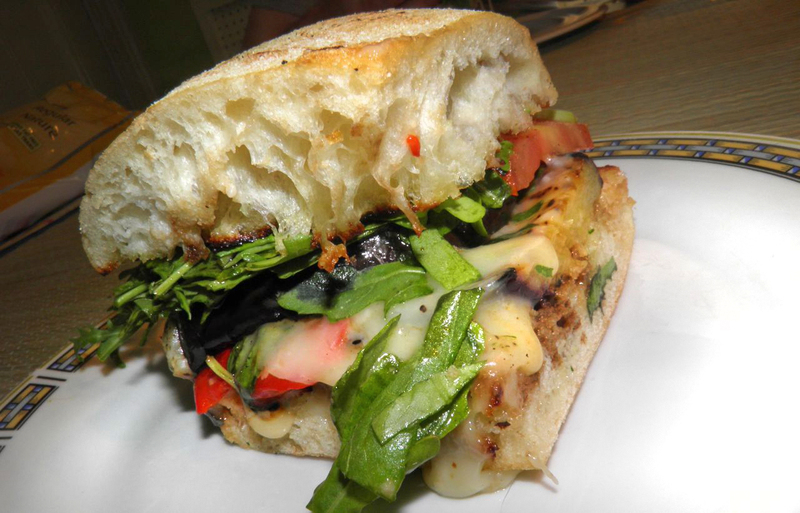 Nothing with “a face” was harmed in the creation of this wonderful sandwich. 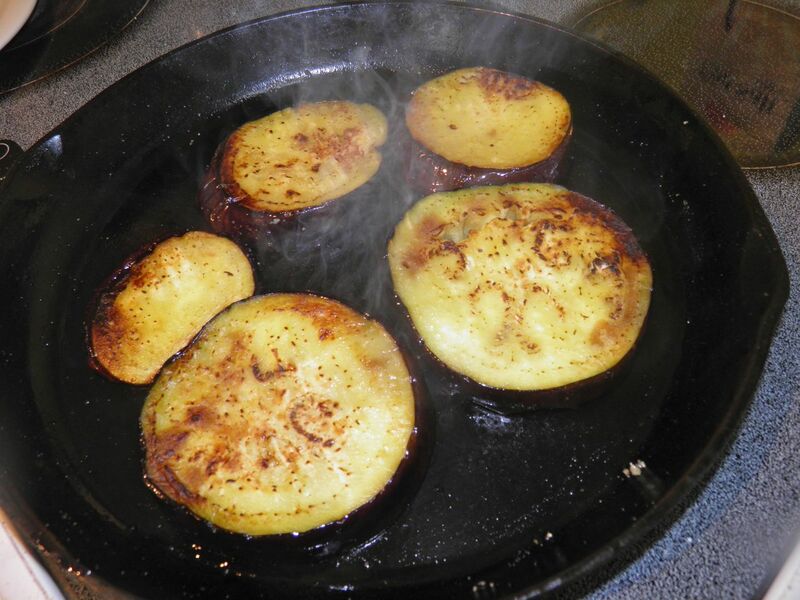 Frying eggplant imparts a smoky flavour. Layers of fried eggplant nestle between fried bread sprinkled with tart, fruity balsamic vinegar, with cheese, tomatoes, roasted red peppers, basil… As you can see, the flavours in this just keep building and building. By the way, not all balsamic vinegar is created equal. The better quality your vinegar the better your sandwich will be. It really makes a difference. If you’ve never had oil and balsamic as an appetizer at an Italian restaurant try it. It's in something a simple as this where good quality ingredients really shone. Mix some extra virgin olive oil with some balsamic in a flat dish. Dip fresh crusty Italian bread in it and enjoy. It’s amazing, and addictive. I had to paint a room last night (about 3 hours) – we’re soooo close to getting the house on the market it’s pathetic – so I needed something fast, nutritious and delicious for dinner. It’s pretty easy to find a wide range of recipes to choose from on the Web if your search parameters are clear. This recipe is based on one I found on medicinenet.com. My google search parameters were “fast healthy recipe”. Simple, eh? This meets all three. 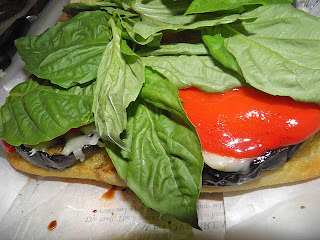 Lay out some paper or other surface to assemble the sandwich. It’s a messy venture. Slice the ciabatta in half and brush with some olive oil. Brown the faces of the bread in a very hot frying pan. Remove to the prep surface and sprinkle with some balsamic vinegar. Slice the eggplant into 1/2 inch thick rounds. Season with salt and pepper. Add some olive oil to the pan and fry both sides until well browned. 11. sprinkle liberally with balsamic vinegar. Close up the sandwich, press down and cut into four equal pieces. This sandwich is a quick way to put a fairly nutritious meal on the table in a short amount of time.